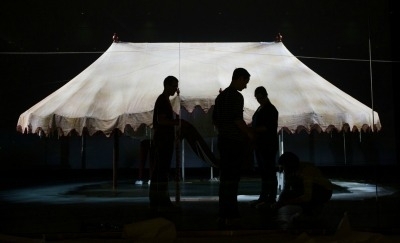 PHILADELPHIA — Applause and cheers broke out at the soon-to-open Museum of the American Revolution here on Friday when its centerpiece, a fragile, 10-foot-tall elliptical tent, was finally erected. The linen marquee was the office and living quarters for George Washington during much of the Revolutionary War — "the first Oval Office," noted R. Scott Stephenson, the vice president of collections, exhibitions and programming at the museum, which will open on April 19, two blocks from Independence Hall. Conservators, engineers and museum officials had spent years working toward this moment, the realization of a dream that began in 1909 when an Episcopal minister, hoping to build a museum, bought the tent from a daughter of Robert E. Lee. Washington, as commander of the Continental Army, not only slept there. Between June 1778 and 1783 he remained inside "its venerable folds" for hours at a time, as his adopted son, George Washington Parke Custis, wrote in "Recollections and Private Memoirs of George Washington," and he ordered that "he should on no account be disturbed, save on the arrival of an important express." In this tent, Washington weathered the Battle of Monmouth, plotted the Siege of Yorktown, conferred frequently with Alexander Hamilton and changed the course of history. At the $120 million museum, designed by Robert A. M. Stern Architects, the tent will occupy a climate- and light-controlled space behind shatter-resistant glass. "Having any George Washington artifact is important and having one as tangible as this tent is quite extraordinary," said David N. Redden, a former vice chairman of Sotheby's, who in 2006 sold a Revolutionary War battle flag for $12.33 million, still a record price. He declined to value the tent, but added, "I can't think of any other Revolutionary War tents that survive." It's lucky this one did. Washington ordered it when his first field tent began rotting during the brutal winter of 1777 at Valley Forge. Designed just like the first — with a scalloped valance, trimmed in scarlet, dropping from two peaks over the outer walls — this one passed by inheritance from Custis to his daughter, Mary Anna, who married Lee long before he became commander of the Confederate Army of Northern Virginia. It was seized by federal troops in 1862 and eventually sent into storage at the Smithsonian Institution. There it resided until 1901, when, after petitions by the Lee family, President McKinley returned it. In 1909, to raise money for Confederate widows, Mary Custis Lee sold it for $5,000 to the Rev. W. Herbert Burk, founder of the Valley Forge Historical Society, whose collection was given to the new museum in 2003. Readying it for display was complex, even for Virginia Whelan, a textile specialist who has conserved a cotton shawl worn by Gandhi and the coat Franklin D. Roosevelt wore at Yalta, among other artifacts. A one-square-yard piece was missing entirely, probably cut up at some point for souvenirs. The linen bore about 550 jagged holes, ranging in size from a thumbnail to a couple of playing cards. And it had stains. "I wondered if someone spilled their grog, or is it sweat?" Ms. Whelan said. "Or did it come from candlelight?" Working in silence, wearing a thimble but no gloves, Ms. Whelan layered fine, nearly invisible netting over and under each hole, then used polyester thread finer than human hair to stitch around the damage to prevent further fraying. For large tears and the missing piece, she worked with the faculty of Philadelphia University's textile design department to make high-resolution images of the fabric, which were printed on polyester with a digital inkjet printer. Erecting the fragile tent, which measures 20 feet by 15 feet, was equally challenging. The 18th-century system of poles and ropes would have put too much stress on it. Alex Stadel, a structural engineer from Keast & Hood, devised the custom base, which looks like two unfurled umbrellas, standing upright and connected by a ridgepole, adding some upright poles on tracks for additional flexibility. Visitors can view the tent beginning on April 19, the 242nd anniversary of "the shot heard 'round the world" that set off the Revolution, when the museum opens in the heart of this historic city, just a short walk from Carpenters' Hall, meeting place of the first Continental Congress. There they may also walk through 16,000 square feet of permanent exhibition galleries that tell the war's story through immersive experiences, recreated historical moments — as when Washington broke up a fight among soldiers — and historical artifacts. Among the other treasures are a 13-star "Commander-in-Chief's Standard" that marked Washington's presence on the battlefield; the first newspaper printing of the Declaration of Independence; and guns, muskets, canteens and uniforms. Mr. Stephenson pointed out, though, that this is not a war museum — and that the story does not end with American independence. The museum takes pains to include the roles played by women; slaves such as Washington's valet, William Lee, who was freed in Washington's will; Native Americans; and, later, immigrants in the tale, a story that continues to this day. "We are still in the midst of this revolution," he said.